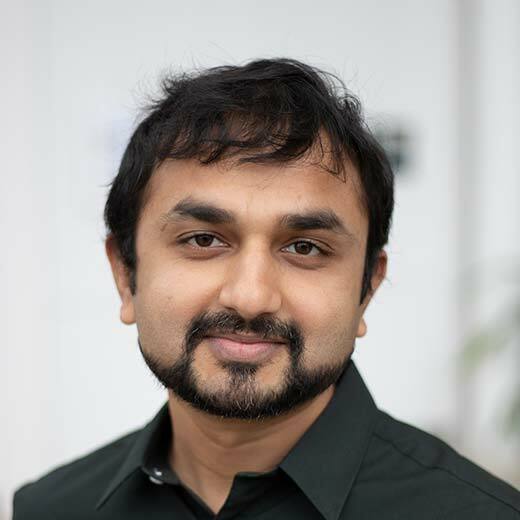 Dr. Roshan D'Souza is a staff scientist at the Rockville Campus of the J. Craig Venter Institute (JCVI). Dr. D'Souza has extensive experience in antimicrobial resistance, bacterial genetics, next-generation sequencing, and molecular biology. His research is focused on tackling the threat of antimicrobial resistance from multi-drug resistance (MDR) pathogens. Prior to JCVI, he worked as a research assistant professor in the Department of Laboratory Medicine and Research Institute of Bacterial Resistance, Yonsei University College of Medicine, South Korea. Dr. D'Souza has constructed panel strains of Klebsiella pneumoniae and Acinetobacter spp. expressing different resistance phenotypes, which are currently being used in the pharmaceutical industry to evaluate the efficacy of novel antimicrobial drugs. In addition, he has also identified novel resistance pathway in Enterobacter spp. and novel OXA-carbapenemase genes in Acinetobacter spp. He joined Dr. Derrick Fout’s team in 2018 and is currently working on bacteriophage genomes engineering and identifying novel resistance targets in MDR strains to help control the global crisis of antimicrobial resistance. Dr. D'Souza received his MSc (2008) in Medical Biochemistry from Manipal University, India and PhD (2012) in Microbiology and Genetics from Chonbuk National University, S. Korea. In 2013, he began post-doctoral research in Dr. Dongeun Yong’s Laboratory at Yonsei University College of Medicine, Seoul, South Korea. Whole genome and transcriptome analysis reveal MALDI-TOF MS and SDS-PAGE have limited performance for the detection of the key outer membrane protein in carbapenem-resistant Klebsiella pneumoniae isolates. First Report of the Carbapenemase Gene blaOXA-499 in Acinetobacter pittii. Panel strain of Klebsiella pneumoniae for beta-lactam antibiotic evaluation: their phenotypic and genotypic characterization. Molecular epidemiology and resistome analysis of multidrug-resistant ST11 Klebsiella pneumoniae strain containing multiple copies of extended-spectrum β-lactamase genes using whole-genome sequencing. The new microbiologica. 2017-01-01; 40.1: 38-44. Prediction of Putative Resistance Islands in a Carbapenem-Resistant Acinetobacter baumannii Global Clone 2 Clinical Isolate. Annals of laboratory medicine. 2016-07-01; 36.4: 320-4. Characterization and complete genome sequence analysis of two Myoviral bacteriophages infecting clinical carbapenem-resistant Acinetobacter baumannii isolates. Journal of applied microbiology. 2016-07-01; 121.1: 68-77. Xpert CARBA-R Assay for the Detection of Carbapenemase-Producing Organisms in Intensive Care Unit Patients of a Korean Tertiary Care Hospital. Annals of laboratory medicine. 2016-03-01; 36.2: 162-5. Complete genome sequence of the siphoviral bacteriophage Βϕ-R3177, which lyses an OXA-66-producing carbapenem-resistant Acinetobacter baumannii isolate. Archives of virology. 2015-12-01; 160.12: 3157-60. Insufficient Discriminatory Power of Matrix-Assisted Laser Desorption Ionization Time-of-Flight Mass Spectrometry Dendrograms to Determine the Clonality of Multi-Drug-Resistant Acinetobacter baumannii Isolates from an Intensive Care Unit. BioMed research international. 2015-01-01; 2015.535027. Complete Genome Sequence of the Siphoviral Bacteriophage YMC/09/04/R1988 MRSA BP: A lytic phage from a methicillin-resistant Staphylococcus aureus isolate. Treatment of obesity with the resveratrol-enriched rice DJ-526. Clonality and Resistome analysis of KPC-producing Klebsiella pneumoniae strain isolated in Korea using whole genome sequencing. BioMed research international. 2014-01-01; 2014.352862. The role of gut microbiota in the gut-brain axis: current challenges and perspectives. Protein & cell. 2013-06-01; 4.6: 403-14. Creation of resveratrol-enriched rice for the treatment of metabolic syndrome and related diseases. PloS one. 2013-01-01; 8.12: e57930. Hepatoprotective and antioxidant activity of aqueous extract of Hybanthus enneaspermus against CCl4-induced liver injury in rats. Experimental and toxicologic pathology : official journal of the Gesellschaft fur Toxikologische Pathologie. 2012-11-01; 64.7-8: 855-9. Genetic engineering of Lactococcus lactis to produce an amylase inhibitor for development of an anti-diabetes biodrug. The new microbiologica. 2012-01-01; 35.1: 35-42. Determination of oxidative stress markers and their importance in early diagnosis of uremia-related complications. Indian journal of nephrology. 2009-01-01; 19.1: 8-12.